DGL is a form of licorice root that has been specially processed to contain only biologically active flavonoids, without glycyrrhizin. This allows for higher dosing of the active ingredient, which helps maintain a healthy mucosal surface. A demulcent that has been used throughout history, aloe vera has long been known to promote a normal inflammatory response. Studies have shown aloe vera is specifically beneficial to the gastric mucosa, in part by its ability to balance stomach acid levels and promote healthy mucus production. 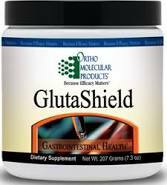 L-glutamine is a main source of fuel for the cells of the small intestines and essential to tissue repair throughout the body. Enterocytes use the amino acid to help maintain the health of the mucosa. N-acetyl glucosamine is the acetylated form of glucosamine. It is a mucin precursor and has been shown to increase the production of mucus within the GI tract.